Here’s how to please the paleos and the vegans. And your old-school uncle. If you’re hosting a party this season, you’re likely going to find yourself accommodating a whole encyclopedia’s worth of varying dietary restrictions. 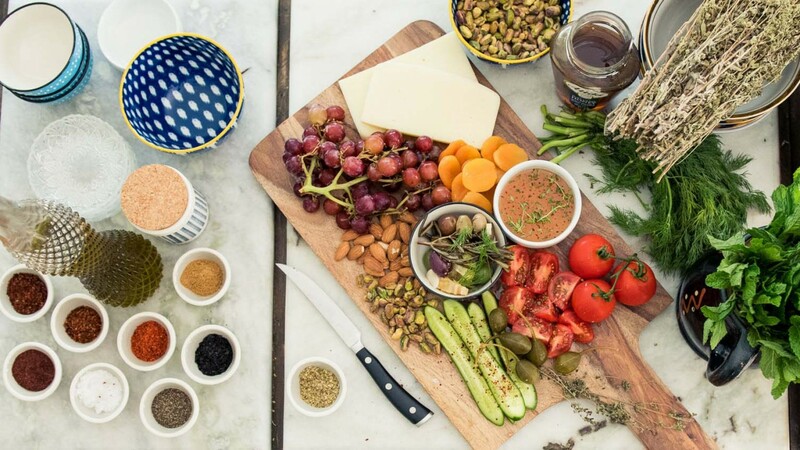 While we can’t quite help you defuse the heated debate between your vegan What The Health-obsessed sister and your paleo CrossFit-ing cousin, we do have a few tricks that can help bring them together: appetizers that hit all the trending diets at once. Yes, that’s including your paleos, vegans, Whole 30s, and even your picky uncle George, who will be surprisingly satisfied with your new pig-in-a-blanket-free hors d’oeuvre spread. How did we come up with this genius plan? We tapped Shira Lenchewski, MS, RD, registered dietician and author of the upcoming book The Food Therapist, for her please-all app recipes. She even gave us an easy shopping list for those of us non-cooks. No one will groan at a crudite when it comes with fresh, bright veggies and Lenchewski’s gorgeous orange-red paleo romesco sauce. She recommends stacking the plate with veggies like red and orange bell pepper, rainbow carrots, radishes, and persian cucumber. “No need to drive yourself crazy, but presentation can go a long way here, so aim to make your spread colorful and uniformly sliced,” she says. 1. Adjust oven rack four inches from broiler and preheat the oven to broil. 3. Slice bell peppers in half and remove seeds and stems. 4. Season with olive oil and sea salt, and arrange on the sheet with the skin facing up. 5. Broil for 10 minutes, flipping once. 6. 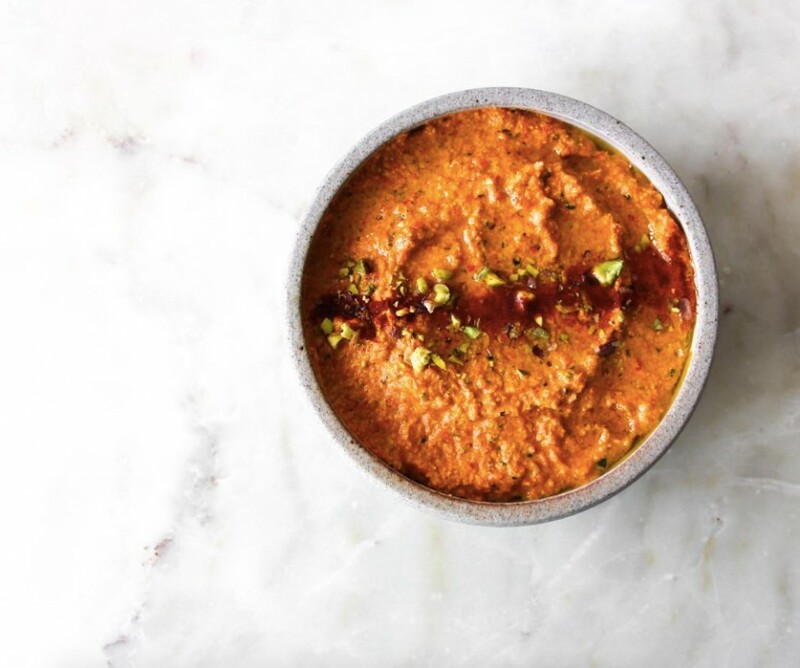 Place the broiled peppers, cashews, basil, vinegar, garlic, and paprika in a high-speed blender, and pulse until well combined. 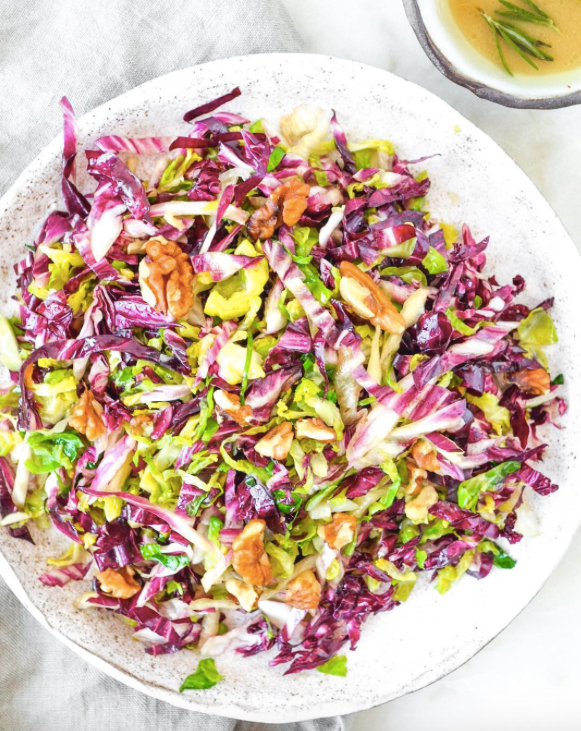 Lanchewski loves her brussels sprout salad, which she douses with mustard and rosemary-tinged vinaigrette, as a healthy and delicious way to curb those hanger pangs before diving into a heavy holiday meal. The walnut-and-brussels-sprout combo is a sure win. 1. Lightly sauté brussels sprouts and shallots in olive oil. 2. Combine with raw radicchio and walnuts. 3. Top with vinaigrette, and season with sea salt as needed. All you gotta do is add some of nature’s butter (my pet name for avocado), and you’ve pretty much got a fan out of anyone. 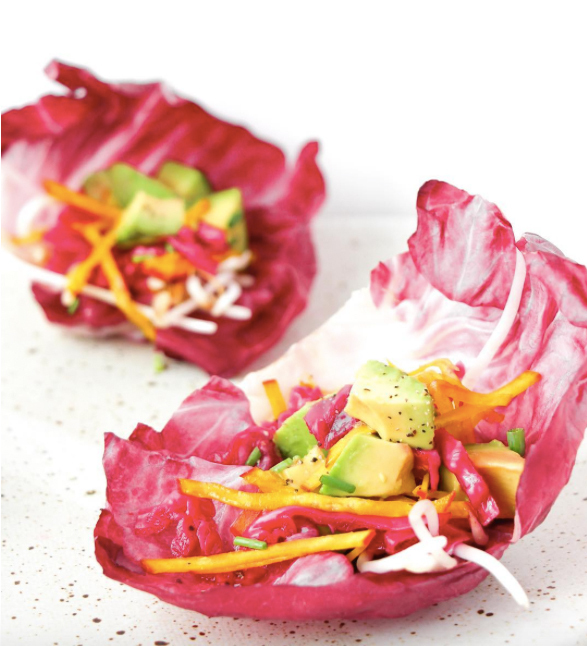 Lanchewski’s paleo radicchio cups have the leafy crunch, the bite of sauerkraut, the creamy goodness of some avocado, and all the spices. Plan to make a lot of these suckers! 1. Assemble radicchio cups by dividing ingredients among each radicchio leaf. 2. Top with lemon juice, sea salt, and black pepper. - Siete Grain-Free Tortilla Chips. She’s pretty obsessed with this find! - Guacamole and pico de gallo (check the label, but many pre-made guacs and salsas, like Whole Foods’, are paleo-friendly) to go with your chips. - Dairy-free pestos, like Le Grand Garden Pesto, are becoming easier to find and go perfectly with some pre-cut veggies. - Roasted nuts mixed with a spice like Trader Joe’s Everything But the Bagel Seasoning Blend. - Pomegranate seeds. Not only to snack on, but they can make everything else look a little extra when you sprinkle them on top.